Supporting the GSC-PNG large-scale effort a team of researchers from Universidad San Francisco de Quito, University of North Carolina at Chapel Hill, and ESPE University, led by Nataly Guevara from the Leibniz-Institute for Tropical Marine Ecology and Max-Planck Institute for Marine Microbiology, set out on a week-long cruise to explore the potential effects of ocean acidification and El-Niño on key components of the marine carbon cycle. This cruise offered us the incredible opportunity of making the ocean our office, by setting up a sophisticated mobile laboratory and carrying out complex experiments aboard the research vessel. The cruise preparation took more than 3 months. The acquisition of the materials, reagents, and equipment from mainland Ecuador to the Galapagos Islands was a complex, time demanding task, and far exceeded the expected costs. Fortunately, the GSC supported us during the paperwork nightmare, provided essential lab equipment and some of their most qualified staff. Moreover, experienced personnel of the Galapagos National Park provided their local knowledge on our designated study sites. The perfect team was ready, although the vast amount of material and equipment, had to be moved from San Cristóbal Island to Santa Cruz Island first, where the vessel M/V Queen Mabel was waiting for us (yellow track). The ocean plays a crucial role of the CO2-balance in the atmosphere. Part of this balance is kept by key processes of the marine carbon cycle. Despite the importance of microbial communities in this cycle, our knowledge of their response to ocean acidification and ENSO events remains rudimentary. The aim of this project, is to study how these stressors affect five mayor components of the marine carbon cycle: The microbial community composition, the concentrations of transparent exopolymer particles (TEP), particulate organic carbon (POC) and dissolved organic carbon (DOC), as well as the potential of forming larger marine aggregates. These processes have previously been studied by using well-defined mesocosm experiments. Nevertheless, laboratory experiments have limitations when attempting to scale-up the effects to real scenarios and tend to underestimate the natural conditions in the ocean. Treatment B: Roca Redonda, located north of Isabela Island, is an active submarine volcano simulating the conditions of ocean acidification. The CO2 originates from volcanic activity and is released through cold vents, acidifying the water column. Treatment C: The Bolívar Channel, located west of Isabela Island, is well known for its elevated phytoplankton biomass, fueled by an upwelling, rich in inorganic nutrients, and by natural iron enrichment from the island platform. Treatment A: Cowley Islet, located at the East of Isabela was our perfect negative control site. Despite of sharing most of the general environmental conditions with the other two sites, there is neither upwelling nor influence of volcanic CO2. At each site we measured environmental parameters such as pH, temperature, salinity, and chlorophyll-a using a multi-parameter CTD. Water samples were collected aboard a small Zodiac using a large Niskin bottle and were transported to the ship to be processed immediately. 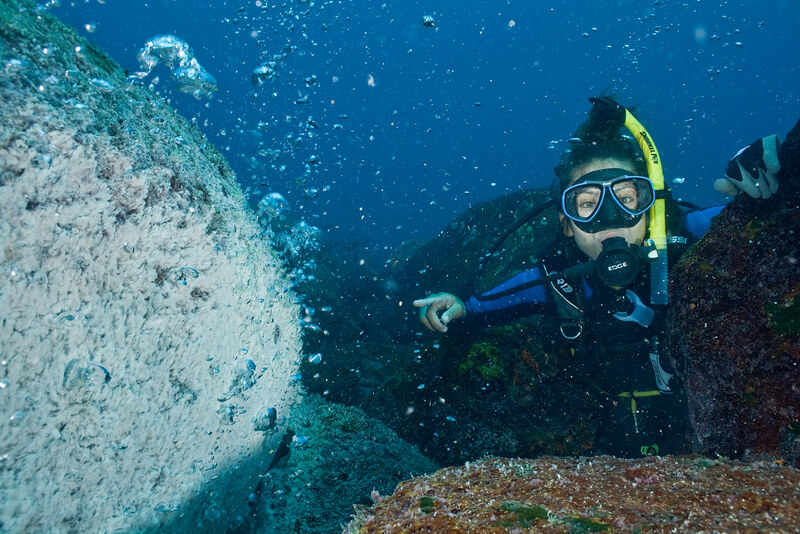 Sampling at the volcano, Roca Redonda, included an additional component: DIVING! Since the exact location of the volcanic activity had not been previously described, we dedicated one entire day for the site characterization. Here, our sampling methodology had to be adapted! One group was scuba diving in order to measure environmental parameters, collect samples and document the process at the precise positions of the highest volcanic activity, resulting in the lowest pH., After sampling, everybody quickly changed their diving gear for a lab coat. The participants: MSc. Maximilian Hirschfeld (GSC), MSc. Daniela Alarcón, BSc. Pablo Andrade (GSC), PhD. Debora Simón, the crew: Capitan Eduardo Rosero, Carlos, Oswaldo, Enrique. 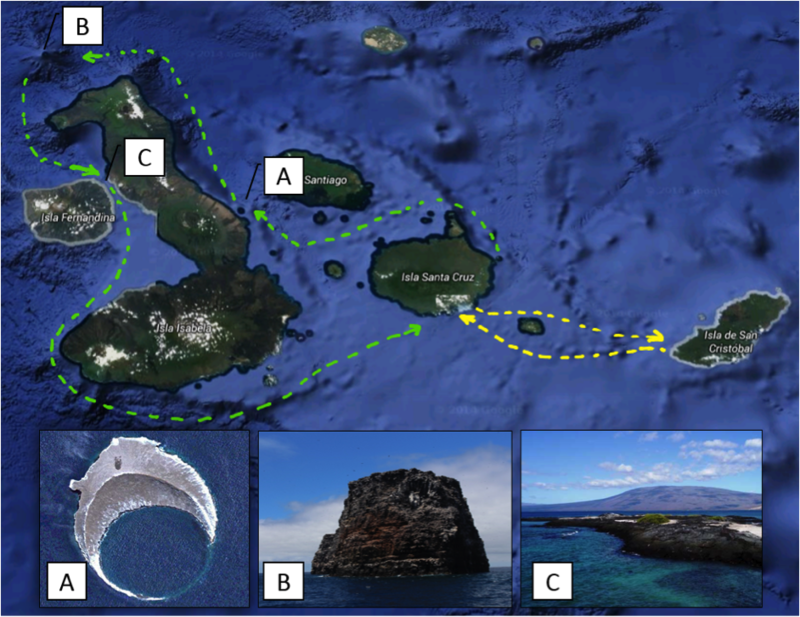 This research project is a joint effort of Leibniz Center for Tropical Marine Ecology (ZMT) GmbH, the Max Plank Institute for Marine Microbiology, the Galapagos Science Center, the Galapagos National Park and the Geology department of the ESPE University. Publicado el 7 diciembre, 2014 29 marzo, 2018 por gscblogger	This entry was posted in Sin categoría. Bookmark the permalink.